Mika Zibanejad, who scored the overtime goal in the gold-medal game to help Sweden win the 2012 IIHF World Junior Championship, will be one of six players from that team taking part in the USA Hockey National Junior Evaluation Camp next week. 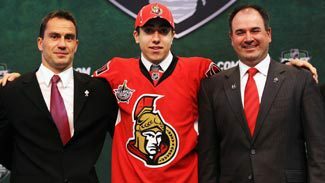 Zibanejad, taken by the Ottawa Senators with the sixth pick of the 2011 NHL Draft, will lead a contingent that could represent Sweden at the 2013 WJC, which will be held Dec. 29 to Jan. 5, 2013, in Ufa, Russia. Aug. 4 USA Blue vs. USA White, 4 p.m.
Aug. 5 USA Blue vs. USA White, 4 p.m.
Aug. 6 USA Blue vs. Finland, 1 p.m.
Aug. 7 Finland vs. Sweden, 4 p.m.
Aug. 8 USA vs. Finland, 4 p.m.
Aug. 9 USA vs. Sweden, 4 p.m.
Aug. 10 Finland vs. Sweden, 4 p.m.
Aug. 11 USA vs. Finland, 1 p.m. Team Sweden will be joined by Team Finland at the USA Hockey camp, which runs Aug. 4-11 in Lake Placid, N.Y.
Other returnees from last year's Swedish team are defenseman Oscar Klefbom, and forwards Jeremy Boyce Rotevall, Filip Forsberg, William Karlsson and Victor Rask. Of the 23 Swedish players attending the camp, 16 have been drafted by NHL teams, including four first-round picks -- Zibanejad, Klefbom (Edmonton Oilers, 2011), defenseman Hampus Lindholm (Anaheim Ducks, 2012) and Forsberg (Washington Capitals, 2012). Also part of Team Sweden's camp roster are two highly regarded players for the 2013 NHL Draft -- defenseman Linus Arnesson and center Alexander Wennberg, teammates with Djurgardens in the Swedish Elite League. Finland, which lost the bronze-medal game to Canada last year to finish fourth, will have seven players from that team in Lake Placid. Among them are two players expected to be high picks at this year's draft -- left wing Alexander Barkov and defenseman Rasmus Ristolainen. Barkov, who plays for Tappara Tampere in the top Finnish league, had a goal and three assists in seven games last year. Ristolainen, who skates for TPS Turku in the top Finnish league, had three assists and a plus-1 rating in seven games. Also attending the camp from last year's team are defensemen Olli Maatta and Ville Pokka, and forwards Joel Armia and Markus Hannikainen. Richard Ullberg, who was the third goalie for last year's tournament, will also be at the camp. Of the 24 players Finland is bringing to Lake Placid, eight have been drafted by NHL teams, including three first-round picks -- Maatta (Pittsburgh Penguins, 2012), Armia (Buffalo Sabres, 2011) and forward Teuvo Teravainen (Chicago Blackhawks, 2012). The teams will practice and play exhibition games against each other and the United States during their week-long stay in Lake Placid.